Just today Elon Musk announced the Tesla & SolarCity solar roof. Is this just another outworldish idea of the man who wants to colonize mars? Or is this another puzzle piece of a disruptive journey that has now reached the building products industry? Still in August in the summer heat, the New York Times published an article on the impact of air-conditioners on climate change. In the center of the discussion were HFCs (hydrofluorocarbons), chemical compounds used in air-conditioners, that trap thousands of times as much heat in the atmosphere as carbon dioxide. The good news is that there is a harmless alternative substance. The US already wants to begin phasing out production and use of HFCs in 2019 in developed countries. In developing countries air-conditioning is expected rise dramatically in the next few decades. The key question is whether all these new air-conditioners will already use the new technology. Admittedly, I do not live in tropical Southeast Asia. But I do live in a penthouse appartment under the roof without an air-conditioner in the town center of Heidelberg. Now in October, this is cosy and warm. In August, let’s say, it can become rather a sauna. More than 50 percent of today’s population live in cities. According to the United Nations Development Programme, that number is predicted to rise to 70 percent by 2050. And in these urban areas 60% are covered by roofs and pavements, expected to increase to 70% by the end of 2040. That’s a lot of roofs. Recent research on cool roofs points to one of the inexpensive solutions to mitigate global warming and reduce greenhouse gases. Passive cooling techniques fight the sauna by slowing down the heat transfer into a building. A cool roof makes indoor spaces cooler and more comfortable without air-conditioning. A cool roof reduces the trapped heat in the atmosphere by reflecting solar rays back into the sky, which can delay climate change. The research paper points out that the colour of a roof has a remarkable counter-effect on the impact of solar radiation on buildings. As an engineer, this doesn’t surprise me at all. But would you go for a white roof to save the planet, and avoid the sauna? In the historic old town of Heidelberg, you will also encounter other obstacles, like local building regulations. Recently, many companies began to provide solar reflective pigmented colours that absorb less than half of the power in sunlight, and thus signficantly reduce surface temperature. So, I may not have to paint it white, but still remain cool. Today’s announcement by Elon Musk’s Tesla was remarkable. The first advertising photos of the solar glass roof tiles on twitter are beautiful – as they do not look at all like solar panels.From the pictures, the options Tuscan, Slate, or Textured look like ordinary roofs. Tesla even boast their glass roof tiles to be more robust than ordinary roofing materials. Will the solar tile truely disrupt the industry? Let’s put it like this: the solar tile, the electric car, and the Powerwall 2 home batteries, remind me of Apple’s ecosystem of itunes, appstore and iphones, on one hand. On the other, there are many uncertainties – starting with the mental image of a very large phone battery in my house. I do hope it does not behave like a Samsung Note 7. SolarCity was initially very successful, and I love the notion of “pay for power, not for panels”. Product as a service lowers the entry barrier quite a bit. The business model itself depends on the external factors – notably the net metering rule. As services charges and rates changed, SolarCity had to cut 550 jobs in Nevada. I am not at all an expert on utilities and energy transition. And I do not know whether we will colonize mars. Compared to painting my roof white, a solar roof (plus Tesla car) could be a lot more costly. Tesla moving into the roofing industry is a wake-up call. Like with Google’s Nest, we see another unusual player enter a rather traditional industry. Building products companies are used to face competition from alternative materials. Companies like Tesla are disruptive innovators. The European automotive industry had to learn this painfully. SolarCity operates with alternative ownership models, like PaaS (Product as a Service) with their SolarLease offering. Philips’ lighting-as-a-service business model is another example for Product as a Service. Philips explains this approach nicely as they merge the circular economy advantages with clear customer benefits. Oxford Economics Forecast predict in Workforce 2020 that 83% of executives plan to increase use of contingent and intermittent employees in the next 3 years. How will office spaces be affected by this? I expect to see more liquid workspace, office-as-a-service, and furniture-as-a-service. I do not have a crystal ball. 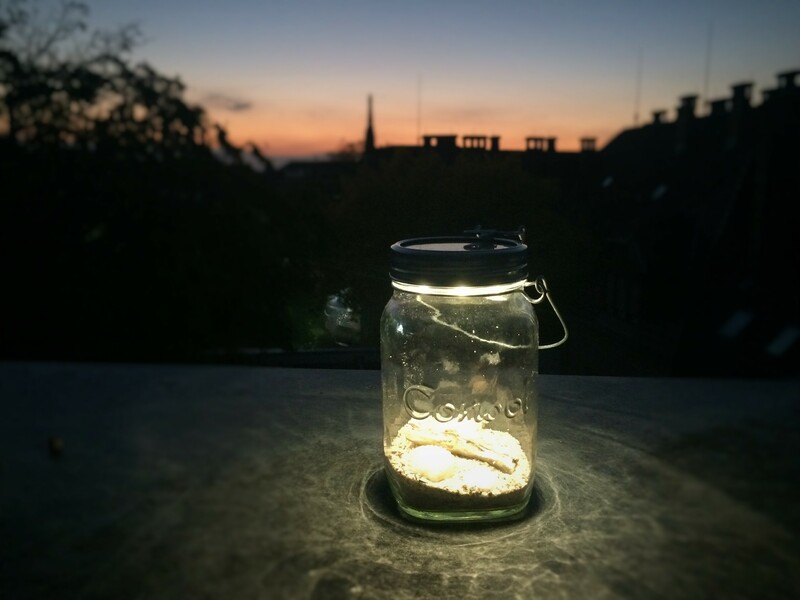 But I do have a solar jar (see above).